Greetings. I was fortunate enought to have taken the empowerment of Solitary Yamantaka from H.H. when he was in Long Beach, Ca april of 2012. 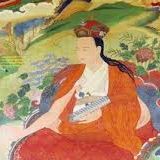 I practice mainly Drikung Kagyu lineage but like a lot of us have a strong devotion to H.H. The Dalai Lama. My question is this, and this is after not being being able to go the the commentary teachings at Thubten Dargye Ling in LongBeach after the empowerment, and this is after looking at yamantaka.org, and google and of course in the sadhanas themselves that were provided they do not specify... What way do the mantra garlands rotate in this practice? Generally speaking-- Father Tantras clockwise, Mother Tantras counterclockwise. Here is one more question to anybody who practices this sadhana. I copied this link http://www.yamantaka.org/practice/sadha ... ation.html" onclick="window.open(this.href);return false; which has the mantra chain and seed syllable. the mantra chain is facing inwards arranged clockwise, does that mean that it does not rotate and only light from the mantra garland goes out during recitation? bryandavis wrote: Thanks for the reply. It's not stationary, it does rotate, I'll send you several things that will help you to study. need to clear your questions completely. I wrote you ASAP with more detailed information. I'll email you as well.